Stephen King's IT spent a lot of time languishing in pre-production Hell, but the R-rated movie finally kicked off principle photography in late July. Since that time, we've gotten to see plenty from the set, including an official reveal of Bill Skarsgard in his full Pennywise the Clown costume. Today, we get some rather intriguing set video shot by a fan, which includes a far away look at The Losers Club. But perhaps more exciting is the first footage of The Leper chasing Eddie. Andy Muschetti, perhaps best known for 2017's Mama, is directing this adaptation of the classic novel, which had already been turned into a seminal miniseries back in 1990. This take will retain the book's main premise, and will be split into two movies. Set in the small town of Derry, Maine, the story revolves around the Losers Club, which includes Bill, Ben, Bev, Mike, Richie, Stan, and Eddie. They are tormented by a strange force, which they must later contend with as adults. About the first video, Instagram user Upreeladam exclaims, 'Caught The Losers Club exploring on #29NeiboltStreet today!' He then goes onto say this about the second video. "Our boy @upreelAdam did some behind the scenes reporting today on the set of #ItMovie looks like he caught The Leper chasing down Eddie!!! Make sure to repost the vid and maybe we can get a special guest from the movie on our next episode!" The Leper is one of the forms IT takes on in the book. When Eddie first encounters It under the porch of the house on 29 Neibolt Street, the monster has taken this form, appearing as a sickly homeless man. In Leper form, It shows that it can kill plants with the touch of its hand. Jack Grazer is playing Eddie Kaspbrak in this new version of the movie. Adam Faraizl played Eddie in the original miniseries, with Dennis Christopher playing the adult version. At this time, the adult Eddie has not been cast. Bill Skarsgard leads the cast as Pennywise the clown. This ensemble also includes Jaden Lieberher, Finn Wolfhard, Jack Dylan Grazer, Wyatt Oleff, Chosen Jacobs and Jeremy Ray Taylor as members of the Losers Club, with Owen Teague playing Billy, a psychotic bully who torments this group. New Line has set a September 8, 2017 release date for IT, which currently doesn't have any direct competition. We're sure more video and photos will emerge as shooting continues. 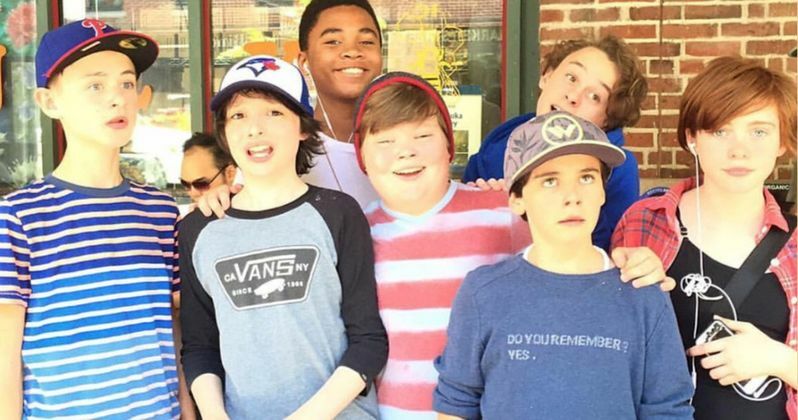 We also have a closer look at The Losers Club thanks to photos from Stranger Things star Finn Wolfhard who plays Ritchie Tozier.